So you wanna make capellini pomodoro, huh? I’m not going to make any claims to authentic Italian cooking here, but I AM most definitely going to be making claims for SUPERdelicious capellini pomodoro with shrimp and that smooth garlic butter flavor that will come together faster than your hungry self could ever believe. No, I mean it. 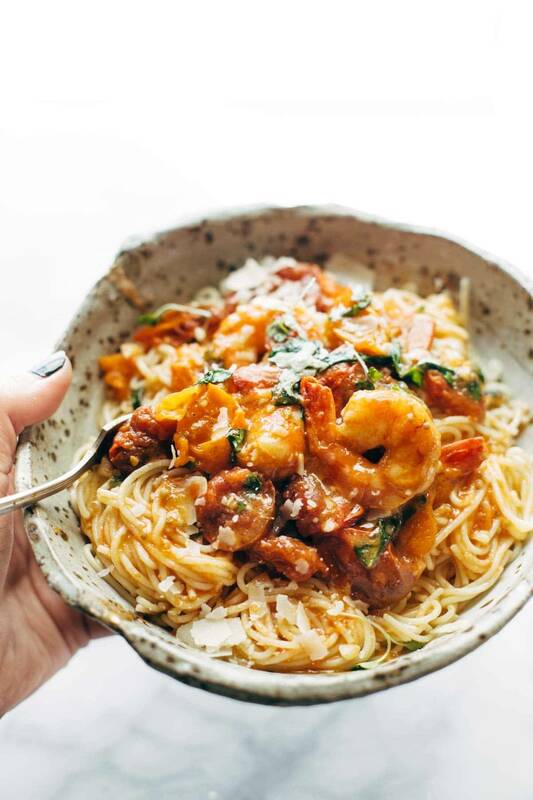 Between the 5-ish minutes to cook the shrimp and the 5-ish minutes to cook the capellini and the 20 minutes to simmer the silky, buttery tomato basil sauce (which can be happening while the other two things are in process), we’re looking at a LESS THAN 30 MINUTE MEAL situation here. You know those times when you just need really good food and you need really fast? No messing around, no massive trips to special grocery stores, no confusing steps? This girl – this capellini pomodoro – is everyone’s darling. She’s here for you when you need her. Summer is coming, guys. Can you so totally feel it? For the last few months, I have been just proudly embracing the dark, cozy, warmth of winter in my life via recipes, capsule wardrobe, photos, and blog content – lots of soups and hot foods, thick sweaters, thicker socks, warming spices (hello winter my perfect excuse to eat curry for 100 days straight), photos with those amazing dark grey linen napkins – but now it’s April and we had like three seconds of sun the other day and I can feel myself and my food and my photos all literally and figuratively coming back into the light. Whee! You know how sometimes the weather just really affects what’s going on in your head? Like how on rainy days, all you want to do is SLEEP FOREVER and on sunny days you become the happiest possible version of yourself and suddenly decide to start training for a triathlon or become a grill master or binge-buy gardening supplies? All because of a little sun? That’s sort of how I feel about this recipe. It’s been cold and rainy and even a little snowy for the last few weeks bc GAHHH MARCH, but then the sun showed its face and I became a new person. I traded heavy boots for light flats, and pulled out the bright white marble board for some summery photo inspiration, and started venturing back into the fresh produce section at the grocery store. !! That basil. Oh, that basil. I’ve missed that fresh basil smell. As evidenced by the steaming noodle pile above, we have been and still are using DeLallo noodles – spaghetti, penne, fettuccine, and now capellini – to dive into when we get hungry for pasta. DeLallo pasta is made with hard durum wheat grown in Italy – you know, real Italy, NBD – and conveniently, durum wheat is the hardest wheat, high in protein and gluten, which is perfect for pasta (although if you’re gluten free, DeLallo also has an excellent line of gluten free pastas as well – I’ve seen it stocked at our Target lately). Because of how the pasta dough is made and shaped, DeLallo pasta is known for having coarser surface made to capture sauces which is EVERYTHING to me. Here’s to the happy flavors of warmer times and the power of a bowl of pasta, fresh tomatoes, basil, garlic butter, and shrimp. I mean, it’s so obvious. 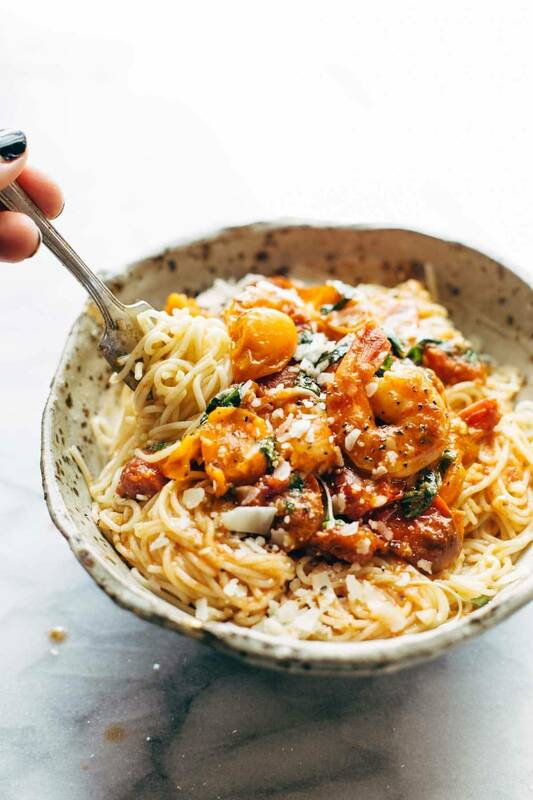 Garlic Butter Capellini Pomodoro with Shrimp – simple prep, easy ingredients: capellini pasta, shrimp, garlic, butter, basil, and fresh tomatoes. Ready in 30 minutes! 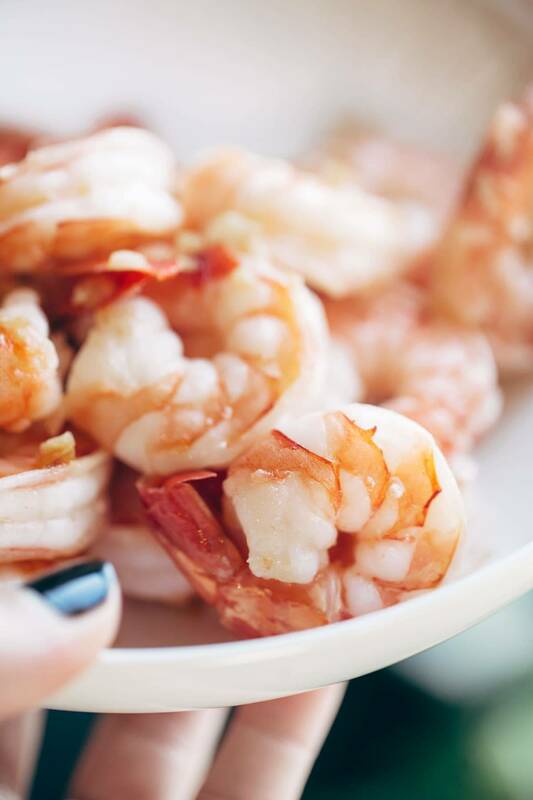 SHRIMP: Heat a swish of oil in a large skillet over medium heat. Add the shrimp and season with salt and pepper. Cook until pink, about 2 minutes per side. Remove shrimp from the pan and set aside. GARLIC BUTTER POMODORO SAUCE: In the same pan, heat just a tiny bit more oil over medium low heat and toss the garlic in. Saute for a minute or two until it smells amazing. Add the tomatoes and broth and simmer for 10-ish minutes. The tomatoes will start to become saucy, and gradually that sauce will start to thicken. This is good. CAPELLINI: Cook according to package directions. Drain and set aside. ALL TOGETHER NOW: Add the butter and basil to the thickened sauce and stir to combine. If it needs thickening, let it hang out on low heat for just a little while longer. Season to taste. When the sauce is ready, add the shrimp back in. Serve the sauce over top of the pasta with a little Parm, salt, and pepper. Pro Shrimp Tip: sometimes I borrow a clove of minced garlic from the sauce ingredients and toss it in the pan with the shrimp for next level garlic flavored shrimp. For serving, you can mix everything together but I found that it just looked prettier with the sauce on top. Thank you to DeLallo for making such delicious capellini and for sponsoring this post! And FYI if you’re local to Minneapolis / St. Paul, DeLallo products can almost always be found in the pasta aisle at Cub Foods. No way! … You must have read my mind this morning as I was just about to search your site for a shrimp recipe and along comes this post! Yeah! This will be dinner tonight … looks so delish! My 4- year-old loves shrimp. Ok, the kind you buy to go fishing with, she plays with them! That’s why her nickname is shrimpy!!!! Anyhow, this looks fabulous and I’m running out of excuses to eat at Denny’s. Besides, that’s icky. But is summer really coming? Because it’s pounding snow here in Buffalo. I know! we just got dumped on with snow the other day too! SAD DAY. but summer is coming! I can feel it! Mam It’s looks delicious. Thank you so much. How about you come over and cook me dinner?! This dish is making me want to dance it looks so scrumptious! Yes ma’am! This looks delicious. Definitely going to have to try this brand of pasta when I’m in the store next – can’t go wrong with a good bowl (or two) of legit pasta. London || Gluten Free with L.B. Oh my gosh, Lindsay, I cannot WAIT to try this recipe!!! Carby italian comfort food, come to mama. Also, I made your cauliflower fried rice this past weekend and LOVED it! Awesome recipe! Hmm. looks yummy, but would taste SO much better with in season fresh tomatoes and basil, the 2 stars of the recipe. I say wait until August and September for this one. In terms of recipe..seems tasty as usual. And I agree with the simple sauce you opted for: we wrote an article about pasta shapes and sauces, and a basic rule is “the thinner the spaghetto, the more delicate the sauce”. I have to ask …. where did you get that bowl?! I am assuming it is a rare, handmade find but I am obsessed with it! My mouth is watering reading this post!! Which Target do you go to?! I’ve seen the GF DeLallo at the Edina and Knollwood Targets but never the regular pasta. I’d love to try their regular “extra gluten” pastas!! YUM! Garlic, shrimp and butter combined? You can’t go wrong. Thanks for a great recipe. I hate it when spring is lagging. Get out the flip flops ASAP. I am wishing warm sunny weather your way so you can put away your boots. I love the combo of tomato, basil and shrimp! Oh my gosh I totally know what you mean. I’ve been blarghhhhhhing about this whole “end-of-winter” thing. It literally snowed today here in Michigan. Those flakes were so depressing 🙁 But this dish looks like it’s enough to warm me right up – look at those shrimp! I can’t wait to try this – putting it on the menu for next week 🙂 Thanks! gah those snowflakes!! come on Midwest! we are ready for summer! I am drooling over here! This looks so good! I love your close up shot of the tomatoes, stunning! This looks amazing. I’m not a huge shrimp kind of gal but I’m sure it would be great with chicken too. I love the bowl, is it a one of a kind? My father in law makes them! 🙂 cool, right?! I’m lucky! Lindsay, this pasta looks absolutely divine! LOVE! So glad it’s time to pull out the flats and white photography boards in Minnesota… we have another (hopefully last) arctic blast headed our way for the weekend, then I’m hoping to do the same here in Virginia! Hello best Friday dinner EVAH!!! Your recipes are look so good! It looks so good. I love how you put the nutritious facts on their. It will really help me in cooking. I am SO excited for the summer! Four months of fun, here I come! Shrimp, garlic, and pasta = a happy Marina. 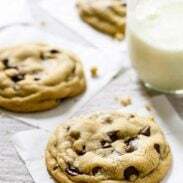 Thank you so much for sharing this deliciousness! thanks Marina! love hearing that! Thanks Hannah! You and I both! Lindsay, the flavors were amazing and we’re just what I was looking for yesterday! The only caveat I have is the the sauce was very thin and took a bit longer to cook to simmer down. Next time I would halve the liquid or go all out as a soup. Good to know. how long did it take you? I would say it took mine about 20 minutes to cook and I actually kept having to add liquid to keep it thin enough to spread out or else it became too reduced – maybe I will clarify that in the recipe. Thanks for the feedback! Simple to prepare with few ingredients. That sounds like a win in my book. Beautiful photos!